This well established business has been in operation for over 4 decades, with the current owners operating the facility for the last fourteen years. This company started as a simple coin laundry operation and expanded by purchasing industrial machines to meet a growing need in the oilfield and hotel industries. The facility is divided into areas featuring a tanning salon, coin laundry area for the general public, and a sales area for new coveralls and gloves. The business also has an industrial machine area where individuals and companies can drop off coveralls for cleaning and repairs. The facility is located in a strip mall setting just off a busy roadway with adequate customer parking, close to residential areas, large grocery stores, shops and gas stations. The growth in the area generates plenty of pedestrian traffic. This successful coin-operated laundry and commercial facility service provides consistently high customer satisfaction with reliable machines in a clean, safe, and attractive environment. Renovations completed to the property in the last five years, included new customer machines, and upgrades to the exterior. 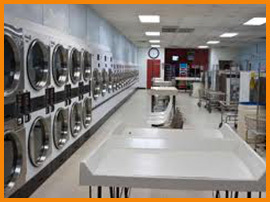 Owning a coin laundry can be a very lucrative business, with lower labor costs and reasonable rent. Renewable lease in place. Well established in the community, offering a variety of services with dedicated staff on hand to assist customers. This efficient and diversified business is an attractive opportunity for an energized entrepreneur to take sales to the next level. Business Sales Memorandum, Financial Statements, Equipment List & Inventory List. Are the premises owned by the Vendor? No. What is the cost of the lease? $13. p/sq. ft. based on 4,500. Sq. ft.
Reason For Sale – Owners wish to retire. my name is jay choi, owner of the business ‘ The laundry’ in edmonton. I want to take some more details.